The demise of the bill was good news, of course. Yet, coupled with the suppression of anti-Museveni protests and the virtual house arrest of leading politicians, it illustrates one of the sad ironies about Ugandan politics: Museveni’s anti-democratic impulses can champion the lives and liberties of some, even as they strip the larger populace of its human and civil rights. By contrast, the large-scale urban protests on display recently were in a different league. Unlike the anti-gay bill, they posed an existential threat to Museveni’s power, which explains why he acted like other besieged autocrats: sending his security forces into the streets of the capital with guns blazing (even as he and other African presidents, under the banner of the African Union, tried to mediate an unsuccessful ceasefire between Muammar Qaddafi and the rebels in Benghazi). Government figures and activists in the United States would do well to reflect on these events—the protests on the one hand, and the anti-gay bill on the other—and their response to them. It’s safe to say that American advocacy, both independent and official, against the anti-gay bill was successful precisely because the United States has a fairly good relationship with the Museveni regime. This isn’t to suggest that U.S. activists were wrong to take advantage of that relationship and speak out against such a loathsome bill. On the contrary, one can argue that American liberals had a special obligation to do so, especially given the evidence that American politicians and clergymen had served as patrons to several of the bill’s most ardent supporters—from the author of the bill himself, to a few prominent anti-gay pastors. But there are costs to these kinds of relationships. 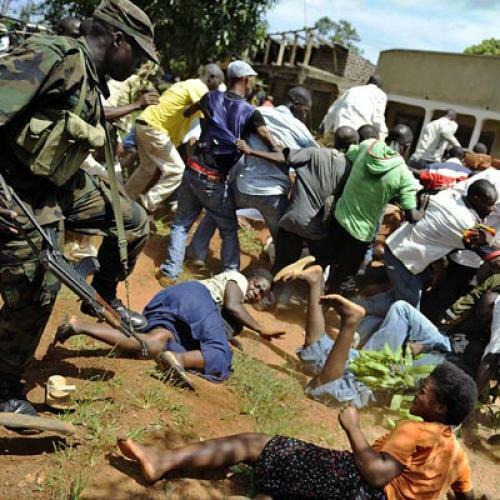 The U.S. government’s public response to the violence unleashed during Uganda’s urban protests was embarrassingly tepid, with the assistant secretary of state for African affairs urging Museveni’s government to be “civil.” Museveni has long since pushed civility aside, however, which was clear recently when he announced his intent to have parliament amend Uganda’s constitution to deny bail to suspected rioters and “economic saboteurs.” This is essentially a recipe for extended detentions without trial. For Museveni, economic sabotage means those activities—think demonstrations—that force the state’s security personnel to do things that make investors nervous. All this leaves Americans in a morally and politically difficult situation: Those of us who expressed outrage over the anti-gay bill were right to do so. But the price of opposing hateful measures against gays can’t be to avert our eyes from the behavior of an ally who tramples on his countrymen’s freedoms. The solution, of course, is not for Americans to stop opposing anti-gay measures. It’s to give as much attention to the overall political situation in Uganda as we did to the “kill the gays” bill. Elizabeth Palchik Allen is a freelance writer and research associate at the Advocates Coalition for Development and Environment in Kampala, Uganda.